The charity challenge, set to be completed by Princess Beatrice and Sir Richard Branson, is a run and hike that covers almost 20 miles to reach the summit of Mount Etna in Sicily. Mount Etna is a main attraction for many travellers on their Sicily holidays. The volcano is the highest in Europe and one of its most active, standing tall above the city of Catania. They will be raising money for the charity Big Change which was set up by the 28 year-old princess and Branson’s children, Sam and Holly- who will be joining the pair on the volcano challenge. The Big Change is involved in numerous projects, which include How to Thrive and Voice 21, with the objective of giving young people essential life skills to be successful in life. The hope for these challenges is to raise an impressive £1.5 million for the charity. This challenge adds to the Princess’ very busy and active week after completing a two-mile swim and 70-mile mountain bike ride earlier this week for the Virgin Strive Challenge triathlon. The Strive challenge raises much needed funds towards the charity. The group are expected to reach the summit some point this afternoon. This volcano hike is added to a list of challenges completed by the Bransons, who started their challenge 30 days ago at the base of the Matterhorn, Switzerland. The three Bransons have completed hikes through the Alps, cycled the length of beautiful Italy landscapes and swam across the Straits of Messina from the mainland to Sicily. Sir Richard Branson continues and is hopeful to finish the entire challenge in spite of a near-death bike crash he was involved in two weeks before the challenge. The challenge has attracted 60 other participants at various stages, demonstrating people’s love for the charity and their brilliant cause. 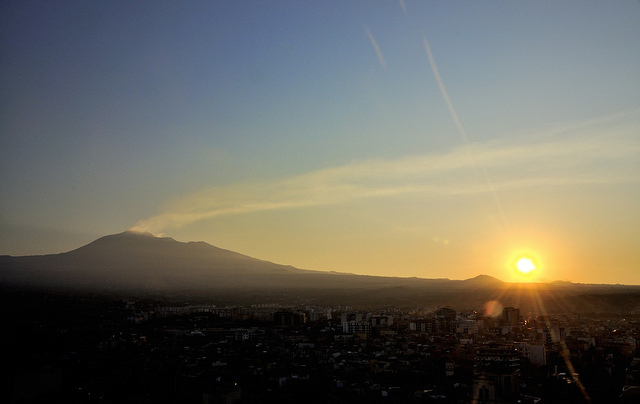 The group can expect a beautiful view across the city when they reach the summit of Mount Etna. If you’re looking to experience breath-taking views on your Sicily holidays, Mount Etna is one to add to your list!